"Mom made these for us for as long as I can remember. They are a great in between meals or after school. Easy to make and great tasting too! Yes, they even have bran (the good for you stuff) in them. Enjoy!" In a large bowl, mix together the peanut butter, bran cereal, powdered milk, raisins and honey using your hands or a wooden spoon. Roll dough into walnut sized balls. Refrigerate until serving. Peanut butter is my power food! These tasty snacks are a great thing to pop in your mouth before you work out--you'll have way more energy! 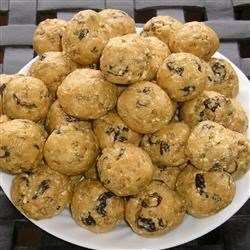 MY kids were leary of the raisins, but my husband and I loved these! I used grape nuts instead of whole bran cereal. Nice crunch.